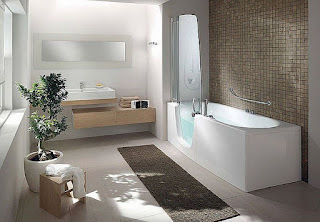 Walk in bath designs fit today's style believe it or not and don't think its just for old people either! A lot of us help our parents as they get older and in that we help prepare their homes for them to make things easier. Like a lot of walk in showers, walk-in bath tubs are just as popular these days reducing the need to climb, reach, bend or stretch benefits users of all ages. Statistics show bathroom to be one of the most accident prone rooms in the house and this reduces the risk of falls. A lot of us plan to stay in our homes as long as possible and this may require advanced changes / planning and things they took for granted may become challenging with age. This includes the simple things such as stepping in and out of the traditional bathtub. Getting out is the most difficult as you lose strength and mobility. The styles today can be stylish and sleek and there are plenty of designs to fit any style / lifestyle. Non skid seats / floors. Doors with double gasket seals so you don't have to worry about leaks. Additional options include heaters to maintain water temperature or even added "jets" for the hydrotherapeutic massage. This benefits your muscle tone, flexibility, ease aches and improves circulation. It can add value to the property. An insurance policy in the bathroom as walk in style tubs reduce the risk of falling which is the number 1 fear of older adults. In most cases they can be fitted within a few days to avoid minimum disruption. Majority of companies if not all offer free consultations in the comfort of your own home. You must be in the tub before filling it with water which provides you with the challenge of staying warm but also having the adjust the temperature. The same with emptying it having to stay in the tub and keeping warm as it empties. These tubs hold more water than the traditional bathtubs. Costs can be quite high to get one installed, however as with everything there is always something to suit every budget high or low. Overall one of the most compelling arguments for walk in tubs is the fact that they could save a significant chunk of change in the long run when you compare something like the cost of the tub to the cost of a fall.